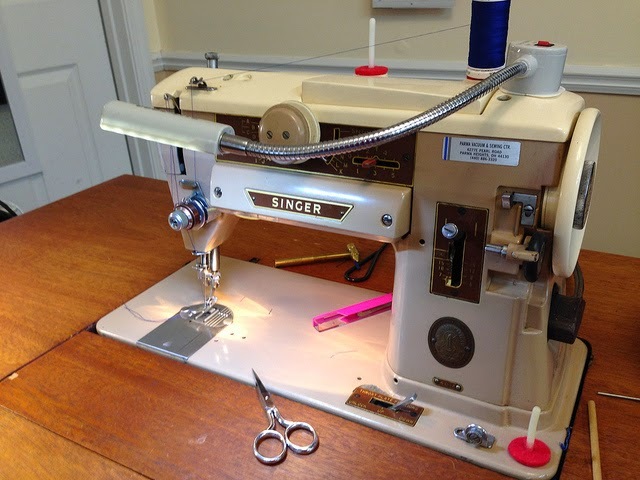 Here I write about my adventures both good and bad in sewing clothes for me and my family with the occasional non-garment project thrown in. Time has just flown since my last update way back in September and there has been either no time or no inclination to edit pictures and write an update. But things are really progressing right now and I wanted to catch up so we can continue to have this record of how the addition was built. Though the foundation was completed by September, it was December before our builder was free to start our project. It was pretty exciting to see the floor, walls and roof going up. As part of the process, we needed to have the upper story west windows removed to make way for the roof of the addition. One window was in DH’s office and one in the office closet. The closet window was probably one of the oldest in the house, but unfortunately had rotted to the point of no return. The office window had already been replaced once before. DH was sorry to lose that natural light into his office but there just was no other option. While we were at it, the office closet was also repaired and new Sheetrock installed, making it much neater looking. Upper story windows needed to be removed. Completed closet on the left, closet with paneling minus window on the right. This next picture shows the addition as of the first week of January. As the builders were laying the roofing paper, we were getting freezing mist. Work was stalled for the next two months as we got snow, ice, and sub freezing temperatures. We looked out the dining room window a lot and dreamed of the day it would be all done. The weather finally let up in late February and things really got moving in March. 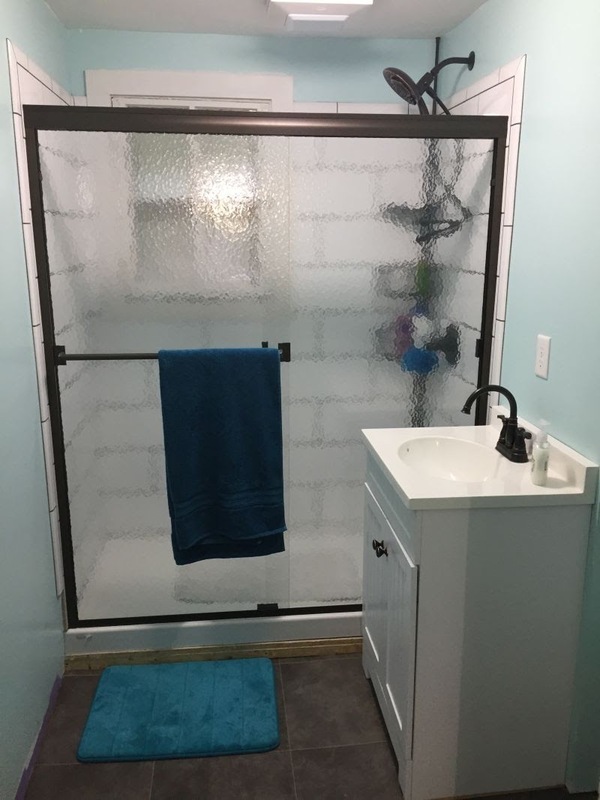 In the space of just a few weeks, we got a roof, doors, windows, the electric and plumbing rough-ins, ductwork into the bathroom, master closet and laundry room (we will be using mini splits for the bedrooms the same as the upstairs rooms). Last week, we got insulation and gutters and this week is all about Sheetrock. As of today, all of the ceilings and most of the walls are done. It looks like a house!! Hallway from laundry room into bedrooms and bathroom. The long window to the left was the window from the dining room. We wanted to save it keep as much of the original house in use as possible. Unfortunately, when the builder took it out of the wall, he discovered that the smaller window on the left was in poor shape and couldn’t be saved. 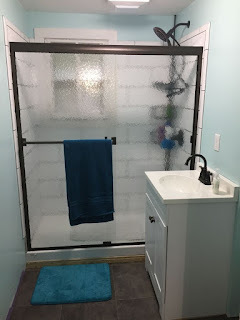 We had two choices: he could save the remaining windows even though they would be odd sizes or order a new window which might take several weeks to arrive. We decided to keep to the original plan and keep the window. It might look odd to someone else, but it is part of the history of the house and I love it. One thing that we discovered after the builder removed two layers of siding from the house was that this window was not original to the house. This is an edited picture of the wood under the window on the outside of the house. It looks to me that the original boards were diagonal (I am curious as to why). I have outlined in red where it looks to me that someone filled in the bottom part of a taller, narrower window and installed this short, wide window in its place. Since we know that the house got all new floors and new plumbing in 1922 based on the newspapers we found under the oak flooring, it is not out of line to think that the house was completely remodeled at that time. Maybe it also got all new windows. I have many more thoughts and theories on the history of the house, but I want to do more research before I write that post. Most likely, by the time I can write the next post, the addition may well be finished and ready to furnish and occupy. We are counting the days. We have been very busy the past couple of months! First we traded the "smoke house" (aka the shed behind the house) for additional work on the house, mostly repairing and re-glazing the old windows. 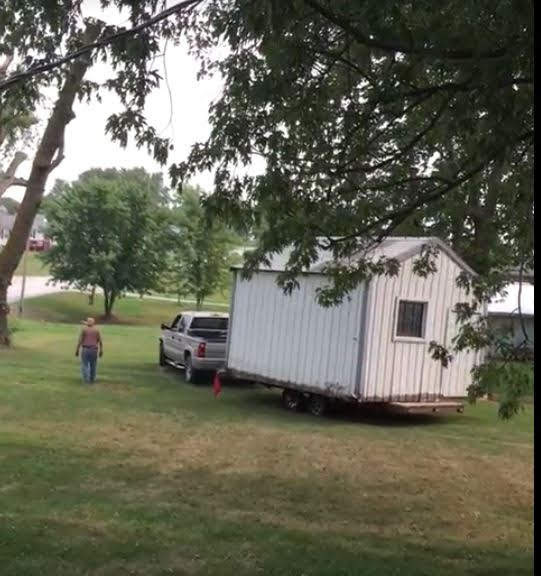 It took a lot of prep work on the part of the gentleman who took it home, but I thought it was really cool to watch it roll away. 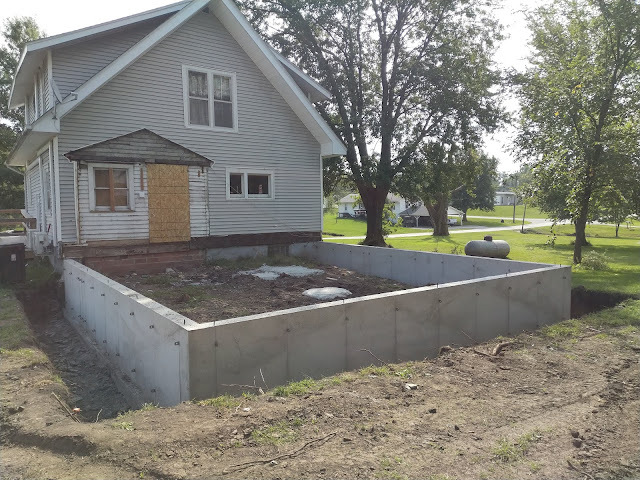 We ended up hiring a different contractor for the foundation and once he set a date, our general contractor came out and tore off the old bathroom which had been constructed from an old porch. After the first day, we could see the original porch that had been enclosed to make the bathroom. The original bead board ceiling was still there. The other side of the bathroom. I had been hoping that this window was still intact. Even the glass is still there. This is the other side of that window. If it works out, I plan to open it back up and use it as a pass through to the pantry. The dishwasher and a single bowl sink will be installed on the other side. Demolition complete! Here you can really see the original brick foundation. I forgot, our mini splits were installed in early August and provide a welcome change from the noisy window A/C units. 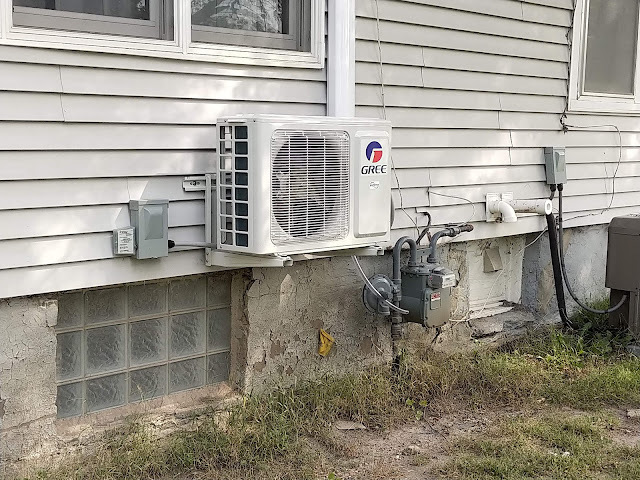 This is the inside unit for the west bedroom and the picture below is what the outside unit looks like We installed three of these for the two bedrooms and the office upstairs instead of opening the walls to install duct work. The nice thing about them is that each room can be adjusted for the comfort of the occupant. Meanwhile, I got busy and painted the last bedroom of the original house. Like all the other rooms, it required three coats and could have used a fourth. This is before, with a chalky purple paint and faux wood grain painted trim. And this is after. It is a little dark in that room, so it is hard to see the lighter color but it is so much brighter than before. The room is on the west side of the house and shaded by a large tree which is great for keeping the room cooler in the summer and warmer in the winter but not so great for taking pictures. We are using Gliddon Country White throughout the house except the kitchen, pantry and bathrooms. Buying premixed colors means that I can drag out painting and not worry about matching colors. 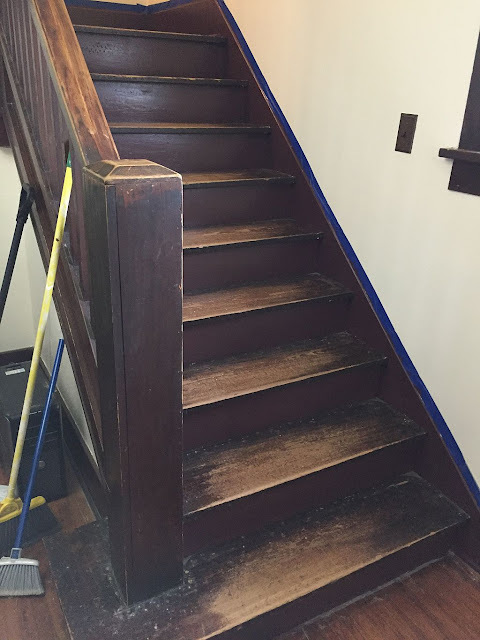 The trim is Behr Marquis Wild Bosenberry as it matches the original stain found in the entrance hall. This room is going to be doing double duty. Originally it was going to be our son's room, However, when he was put on a wait list for campus housing, he opted to find a small apartment instead. With his school and work schedule, it is unlikely he will be home very often. It seemed inefficient to just let the room stay empty while he was gone. It is unlikely he will be home next summer as his technical college requires a summer internship. 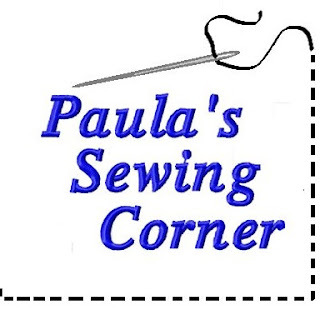 So while he is gone, the room will be my sewing room and when he is home for visit or we have overnight guests, it will be the guest room. The bedroom is a fairly small room, only 9 ft by 10 1/2 ft so I am asking a lot of the space. To make the best use of the space we have, we bought a Murphy cabinet bed. The mattress folds up and stores in the cabinet. When you need the bed, the top comes off to become the foot of the bed, the front pulls down and the mattress is unfolded to be the bed again. It only comes in a queen size which takes up most of the bedroom with just a couple of feet all the way around it to spare. I plan to use this cabinet as my cutting and pressing table once I can set the room up as sewing room. I will put my Big board on the top of the cabinet and keep my gravity feed iron off to the side. This is what it looks like without bedding. The nice thing about the design is that once folded up, there is still some room for pillows and a blanket before you put the top back on. For the rest of the room, I have three Gidget tables that can collapse to be stored under the bed and every thing else can be stored in the closet. When the occupant leaves, the bed will be folded back up and the machines can come back out to play. I will put up pictures of the sewing room when it is complete. For now, until the addition is complete and DH and I have our master bed room, DH and I are sleeping on this bed. We had to add a mattress topper (the mattress squashes under my weight) but otherwise it is fairly comfortable. And finally, our foundation was dug and poured last week! We are waiting now for the concrete to cure so they can begin framing. Phase 1 of our move to DH's hometown is complete. We have moved, the old house is sold and we are settling into our new community. My last blog post was the first of March. After that, life got crazy busy: school, graduation, church, 4-H, getting the old house ready to go on the market and packing, packing, packing. Whew! By the end of March, we thought we had enough done at the old house to start moving in. The final trim was installed in the office and was painted. Octagonal window over the stairs. Forgive the selfie: it's hard to take a picture of a window after dark. We finally got to pull the carpet off the stairs. 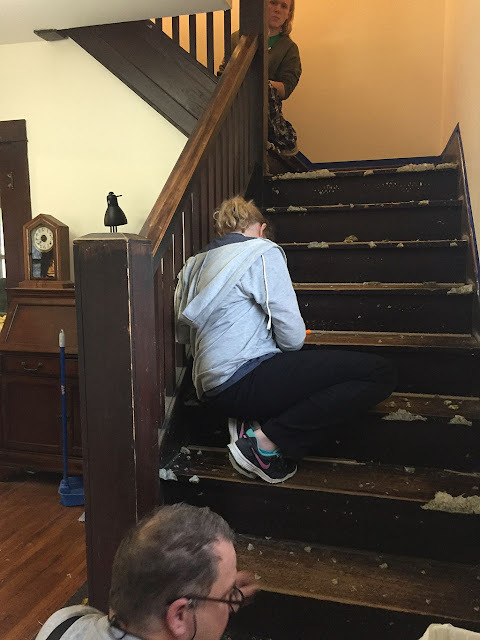 We waited with that task until most of the painting and moving was done so that we wouldn't tear up the stairs even more. Pulling staples can be a fun family activity! Stairs after painting the stair backs. I think we pulled about a million tiny staples from multiple carpets from those stairs. We found at least two different carpets that have been installed over those steps in the past and both aluminum and copper staples. After we were done, I painted the trim and the backs of the steps. We are leaving the steps uncovered for now. Though we had hoped to have the new counters installed before we moved, it didn't quite work out. I had measured the north side counter (longest side with the sink) incorrectly and it was 5 1/2" too short and had to be re-ordered. The counters and new sink were installed while I was back at the old house with the kids and I got to home to pretty new counters. West and North walls. Please excuse the dishes. So nice having my own gas stove again! Again, please excuse the mess in the dining room. 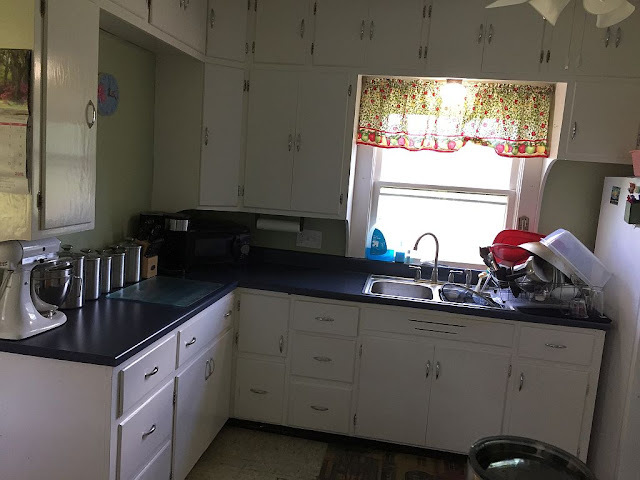 The counters are Formica laminate in a slate blue. We also had the cabinet that was to the right of the stove switched out to these narrower 12" cabinets on both sides of the stove to pull the stove away from the drywall covered chimney in the corner. I am still debating on painting the cabinets to match the others. 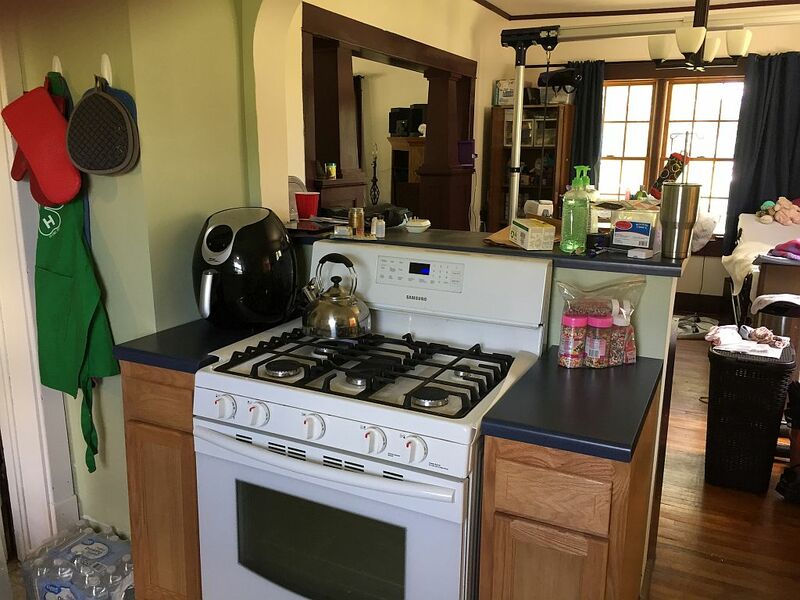 I think the wood is pretty and the fact that they totally mismatch the original cabinets doesn't really bother me. 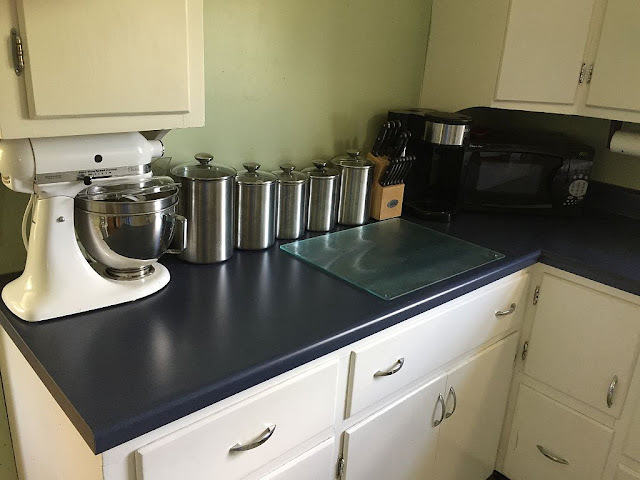 Unfortunately, it turned out that the first set of counters were delivered without a backsplash and the no-drip edge that we had ordered. The replacement countertop for the sink side came in and was correct, but the edges didn't match up and that leaves the potential for ruining the counters as water can seep into the seam. We have the new counter top for the west wall sitting in the living room now and it will be installed soon. As DH put it, that was one big root canal! We moved the end of May and I didn't take pictures of moving day as I was just too busy. It went relatively smoothly despite DS spraining an ankle. We are now as settled as we can be while still waiting on the addition to get started. We have a few more things to finish on the original house, but they will wait until school starts in three weeks so I can spend as much time with the girls as I can. I hope to get more and better pictures then. 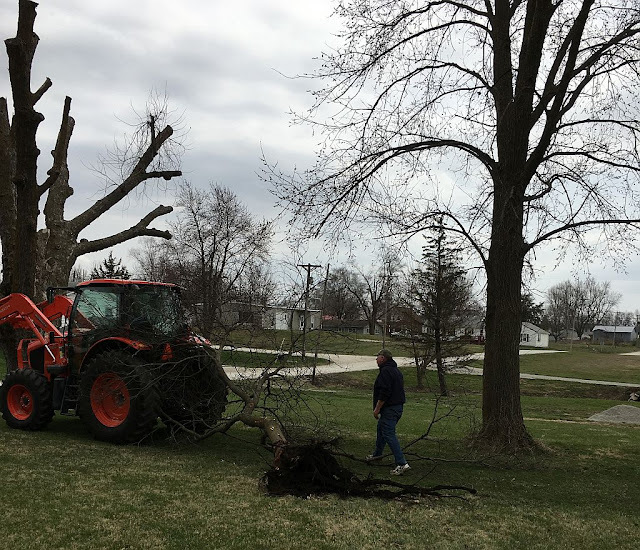 Thanks to the weather, we haven’t been able to do a lot to the old house. DH has been up a couple of times, mostly to visit his parents. He and I did get away the first weekend of February sans kids for a weekend which was wonderful. For that weekend, we rented a U-Haul trailer and loaded it with stuff from closets and under the basement steps that we aren’t using at our current home. We figure the more small things we can move now, the less we will have to do for the big move this summer. We moved our bookshelves and books also. Most of these books are old favorites we’ve all read over and over as well as sewing books, computer programming and networking books and lots of books left over from various Bible studies. I did a little more painting as well. This is DH’s office where the trim was all painted white. I used the same Wild Bosenberry paint that I used for the downstairs trim. There is still some trim to be installed. And we still need the door coming into the office. I decided that I want to repaint the trim in the upstairs hallway and the wall side of the staircase all the way down to the main floor. The trim has been painted before and is very chipped and dirty. I also want to repaint the upstairs bathroom trim using a marine type paint to help prevent damage from moisture. This will be particularly important with the window in the shower..
We would prefer to not have to replace that window due to rot. I still have to paint the Scout’s room and that should be the last of the painting. I was going to wait with all of it until the last of the trim was installed, but Dear Husband would like to set up at least part of his office so he can work while he is there for weekends. The only other thing that we have done is to clear out the smoke house and move the good wood to another shed. The smoke house is coming down to make way for the addition. 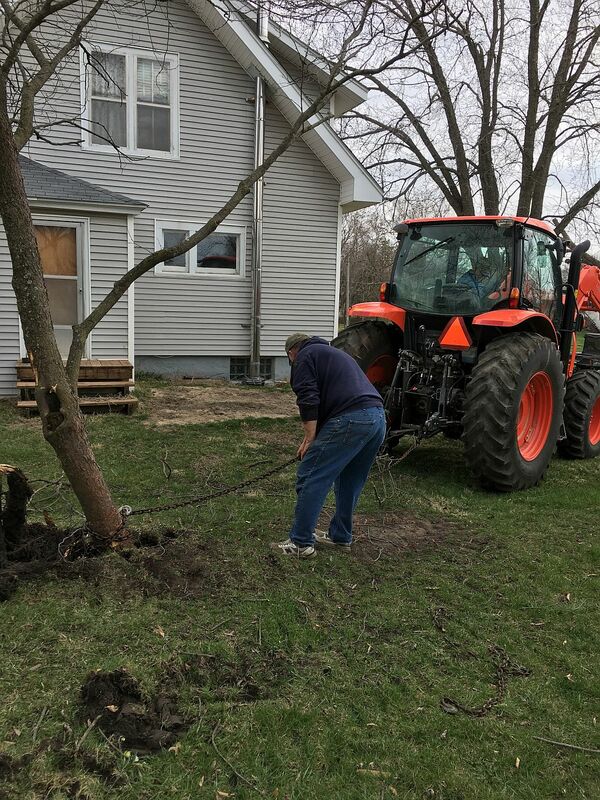 We also have to take down a small tree and move the clothes line. DH has been on the phone with contractors to discuss estimates and time lines and we are now on the list for the foundation work to begin in late March or early April. 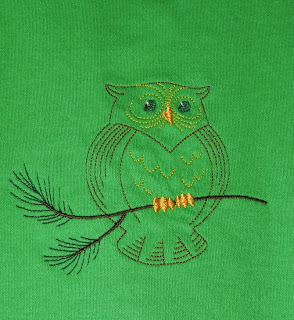 I am hoping to be completely done and settled by the first day of school. Earlier would be awesome but I am trying to be realistic. Things happen. We just have to roll with it. I am still trying to find the best way to blog with the iPad. Google’s only suggestion to use Chrome and request the desktop version of the page, but the screen still bounces to the top of the page with every other letter and I can’t edit the size of any picture other than the first one. The BlogPad Plus app works the best for just typing text, but doesn’t like adding pictures from anything other than the camera roll and I prefer to store them in Google Pnotos. I tried a browser called Puffin which looks promising, but didn’t allow me to select text and weirdly overlays new text over old text, like the old dot matrix printers that would just print the same line over and over. It’s frustrating. I just hope it is not a sign that blogging in general is dying. We don’t have a lot planned for March — just cleaning and packing and maybe taking down the smoke house. April should be when things get really exciting for the old house as we start the construction for the addition. This is a test. This is only a test and you can skip this post if you want. I have been blogging on and off since 2006. 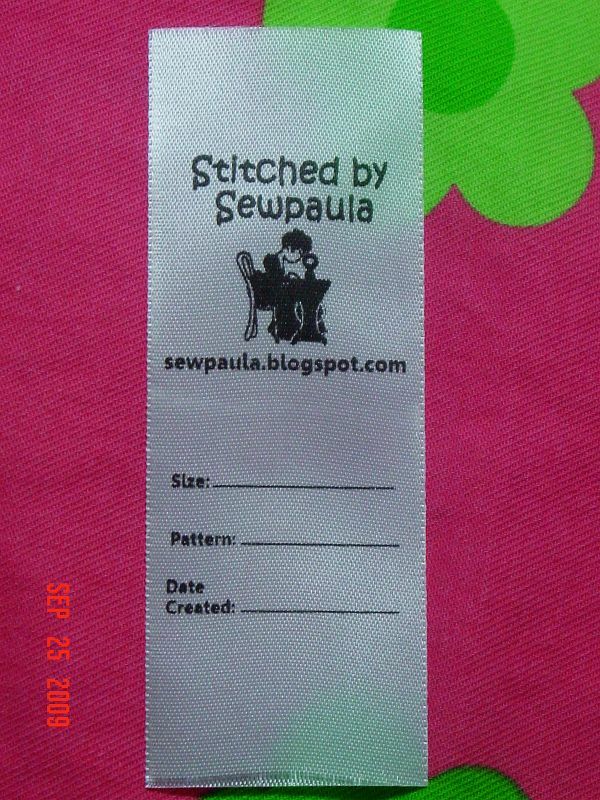 I started it to record my sewing projects and share information about my kids with extended family. For several reasons, I deleted most of those posts a few years ago and stopped blogging for a while. 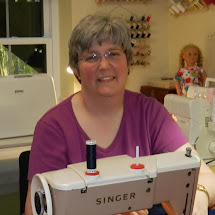 I missed blogging though and resurrected the blog for the same reason I started the blog in the beginning: to record and share my sewing projects. This time, I limited posting about my kids for their privacy. When we bought the old house last year and started renovations, I posted about our progress and only post about our kids when they give permission for me to do so. I have been with Blogger this whole time. It works for me, or did when I wrote most of my posts on the desktop and l stored my pictures on PictureTrail. When PictureTrail got expensive, I moved my pictures around and now upload most of them to Google Photos. I do most of my writing on an iPad because it is much more portable than even my lap. Blogger just doesn’t work well in the mobile browsers. Once you have written more than a couple of paragraphs, it flips back and forth to the top of the page. That’s fine if you write short Instagram type posts with a picture and a caption, but my posts tend to be much longer than that with multiple pictures. Google doesn’t make an app for Blogger anymore which annoys me as it really does seem that Google tends to love to develop new apps, but won ’t support the older ones. I have not found a good app for writing Blogger posts. I am writing this in mobile Word. Writing plain text is fine, but Word will not insert pictures from Google Photos, so I will have to cut and paste the text from Word into the Blogger site and add pictures. Google Docs works the same way. Again, this annoys me. I should be able to insert a picture from anywhere. I am pondering moving the blog to another platform, such as WordPress. If you blog and use a mobile app for IOS that you love for either Blogger or any other blogging platform, will you comment here with what you use and your opinion of it? I would really love to get some new ideas. Sorry for all the odd pictures — it was part of my test.